Did you know that tooth decay is the second most common disease in the world, behind the common cold? This is why dentists, like Dr. Hughes, Dr. Mojdami and Dr. Cakmakci, take such great strides to educate our patients on the best dental care practices, so that even you can avoid the effects of this disease. But for those cases where it may be too late for preventive measures, the results can be painfully deteriorated teeth. What can you do to save your teeth at this stage? Endodontics is the answer. Enamel: This outermost layer is the white that encapsulates the whole tooth, and serves as the first line of defense against bacteria and decay. Dentin: This is the thickest layer, made of a hardened mineral substance that protects the centralized areas of the tooth. Pulp: This is where the sensitive nerve endings and blood vessels reside. If the decay reaches this layer, it can lead to pain, sensitivity and temperature sensitivity. Endodontics is a field of dentistry that focuses on the sensitive pulp layer of the tooth. Since the pulp is the vital centre of each tooth, it’s important that it be maintained and protected. When decay deteriorates the enamel and dentin, the work of endodontics is to clear any diseased tissues in the pulp. This is commonly done through a root canal and filling, which removes the diseased pulp and cleans up any abscesses from the infection. This treatment is designed to remove diseased tissue that could potentially spread to other teeth and to preserve what’s left of the tooth. 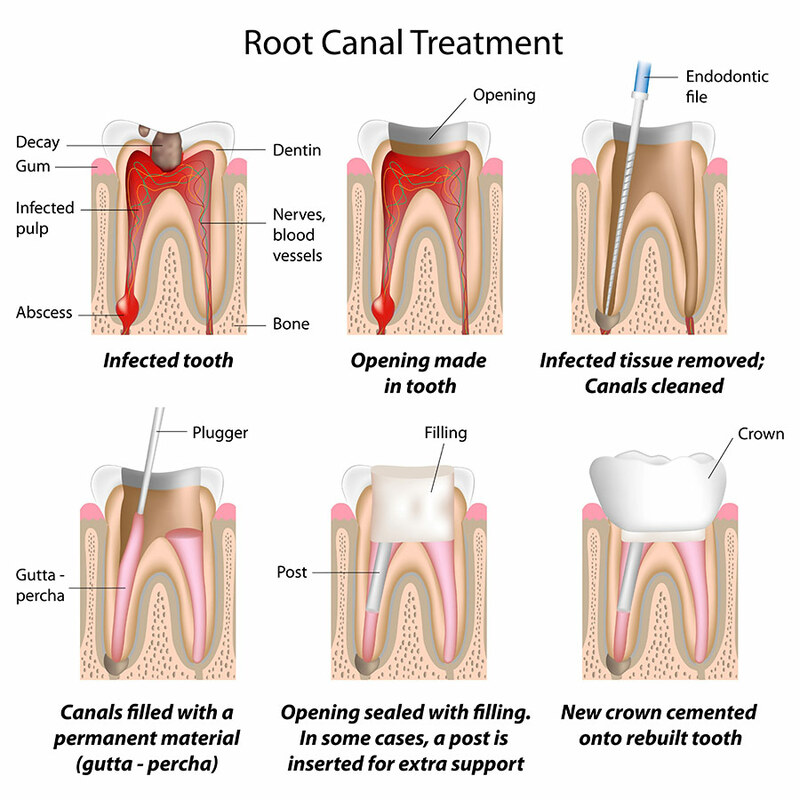 The first step of a root canal is to clear away the diseased parts of the tooth, including damaged enamel, dentin and any decaying tissues in the pulp chamber. Once the tooth is cleared of these decayed tissues, it’s disinfected and filled with a resin. After the tooth and centre are filled, the tooth is topped with a dental crown to protect the new filling. Unbeknownst to a lot of patients, tooth decay can spread from tooth to tooth, especially if there is a lack of saliva or a poor diet. That’s why it’s so important that decay be cleared and treated as soon as possible. Clearing away the diseased tissue can set you on the track towards a healthier smile. Are you experiencing intense toothaches and are unsure about what to do? Contact us at Park Dental to schedule a consultation with Dr. Hughes. We’ll perform an evaluation on your oral health and determine if endodontics is the best course of action for treating your smile.